The Patrick Studio at Birmingham Hippodrome is a thriving hub for festivals, performances, professional development, rehearsals, workshops, conferences, parties and launches. becoming THE space to experience edgy and alternative live performance in the heart of the 2ND city. Associate Director of Birmingham Hippodrome – Chris Sudworth – gives us a run-down of his top picks from the new Patrick Studio season. Dazzling and disturbing in equal parts, MK Ultra explores the rise of a strange, dark myth of our time. How, as millions of young people turn away from established political systems, they are embracing bizarre conspiracies that they see hidden like a secret code in the culture and music that surrounds them. With costumes from Lady Gaga’s designer Gary Card, a gold mirrored stage, hypnotic triangular projections by Louis Price, a pulsing soundtrack of American trap music and a mesmerising score by electro-acoustic composer Annie Mahtani, this utterly captivating show comes direct from Birmingham-based choreographer Rosie Kay, who shot to international acclaim earlier this year after choreographing the Birmingham 2022 Commonwealth Games Handover celebrations. Seeta Patel combines Indian classical dance, contemporary dance and theatre in this explosive one-women show. This fantastic production has received five-star reviews and the Best Dance Award at Adelaide Fringe Festival. If you’ve not been to the Hippodrome to see a dance performance yet I would highly recommend this as your first one! This moving performance by serving forces personnel and recent veterans, tells the story of lives forever changed by war. This ties in nicely with a VR experience we have in the foyer from Mon 29 Oct to Sat 3 Nov, called Empire Solider. This emperive experience puts you right in the centre of WW1 from the perspective of Caribbean and South Asian soldiers. Following last year’s total sellout tour RuPaul’s Drag Race favourite Jinkx Monsoon and lyrical genius Major Scales return. Music and mental health collide in this witty, biting look at the dark side of Drag fame. And, don’t forget the recently announced meet and greet with Jinkx following the performance. 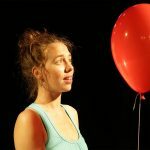 Infinitum before and it’s an amazing company and I can’t wait to see how they tell this story on the stage, all I know is there won’t be another show like it!